Christopher Nolan’s latest is, very simply, a remarkable movie. It appears simple, but ably hides its complexity. It is at once visceral, yet constantly finds a deep emotional core in its actions. It merges multiple storylines yet retains a simple forward moving dynamic. It mixes score into sound design to create one of the finest sounding movies of recent times. It dwarfs with spectacle yet never fails to focus on the individual within. Breath will be taken, and only just about given back at the end. Stripping his dialogue to a minimum (and rarely misusing it) Nolan stages his tension-filled (and fuelled) rescue movie as a triptych – by land, by sea and by air. But nothing so simple from the man who gave us Memento and the dream unravelling of Inception. His three approaches also have three different time frames – land covers the space of a week, by sea takes a full day, whilst Tom Hardy and his fellow Spitfire pilots in the air only have an hour before fuel runs out. Yet all three appear to blend in as one, with subtle moments from one arena of war, playing out in other stages of the other locales. Ostensibly the film focuses on a handful of characters – young soldiers trapped on the beach, Mark Rylance, emblematic of the home sailors who risked everything to bring the soldiers home, the generals as represented by Kenneth Branagh, and the aforementioned pilots. Each has their own focus in this singular event – a retreat that becomes the greatest rescue story of all time. But this is not a film about glory. Interestingly, it is also not a film about any form of defeat (and tellingly eschews the gore of, for example, Saving Private Ryan.). It is, at its heart, a tale of survival. There is plenty of bravery to see – but bravery is not the point. The ultimate act of bravery here is the simple act of staying alive. As ever with Nolan, this is a consummate piece of filmmaking. Praise should be heaped upon the director for opting to shoot not just on glorious celluloid, but on IMAX 70mm, which is put to both stunning and beautifully realised use by DP Hoyte Van Hoytena. CG is at a minimum here, this is old fashioned stuff, but also notably like nothing you have ever seen before. This is thoroughly immersive cinema – without those damn glasses. In part because Nolan, often cited as something of a cold intellectual filmmaker (inaccurately, but nonetheless), here manages to immerse his audience as emotionally as he does visually. Yes, it looks amazing, but sod that – we want that kid to get out in one piece! And aiding an abetting in all that is a breath-taking score by long time collaborator Hans Zimmer. 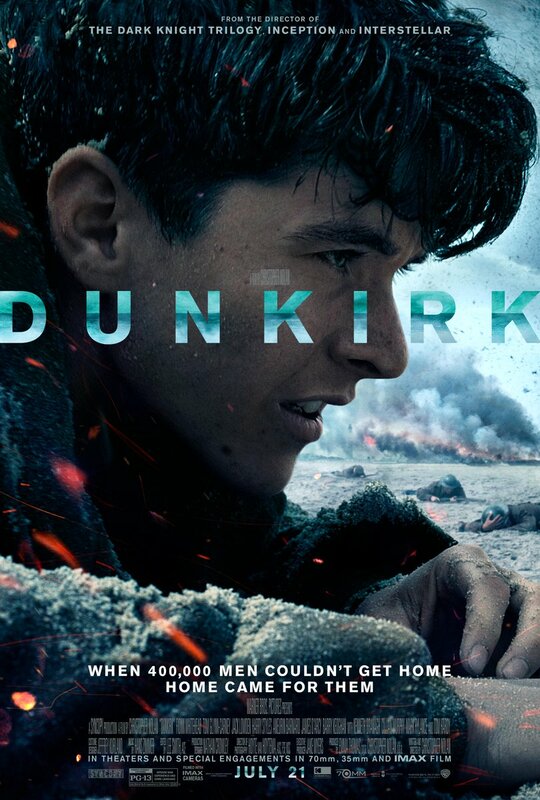 More than anything Zimmer has done before, this score shapes Nolan’s overall vision for Dunkirk, playing over just about every second of the movie, it doesn’t so much dictate emotion as capture it and enhance it. Rarely utilising conventional orchestral themes, it at times sounds industrial, sometimes like it belongs in a horror movie, always there to simply sustain the unrelenting tension of the movie as a whole, and more than anything blend seamlessly with a brilliant sound design, to the point where at times both become almost indivisible from each other. Not that he wasn’t pretty much there already, but with Dunkirk, Chris Nolan has assumed a thoroughly unique place in contemporary cinema. An auteur who makes large budget, mass market movies that are at once personal and yet utterly universal. A filmmaker who reminds people of the sheer enormous power of cinema, always displaying a thorough understanding of how to make an audience both think and be moved, and who never panders to either side of that particular coin. Dunkirk may well be his masterpiece – but then again, the man has a pretty good track record. We saw in in IMAX – you’d be very wise to see it on the biggest screen in your town. There will be Oscars.